"Tactical Media emerged when the modest goals of media artists and media activists were transformed into a movement that challenged everyone to produce their own media in support of their own political struggles. 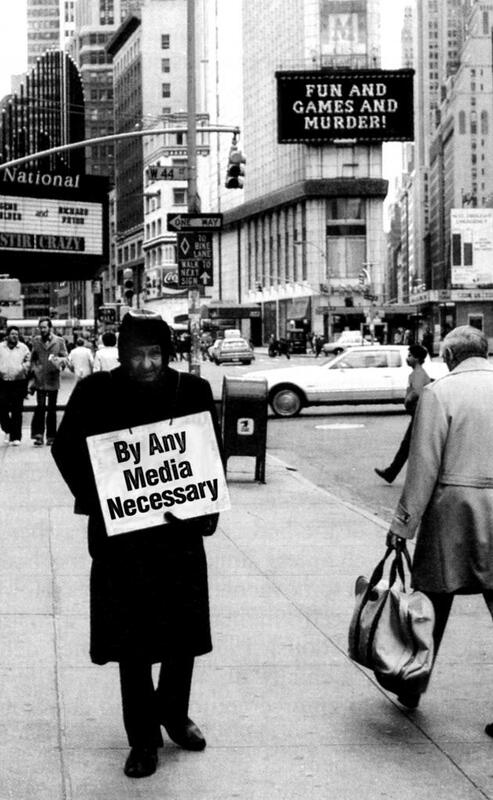 This "new media" activism was based on the insight that the long-held distinction between the 'street' (reality) and the 'media' (representation) could no longer be upheld. On the contrary, the media had come to infuse all of society. To challenge dominant (strategic) structures in society, it was necessary develop new (tactical) means of producing and distributing media. Not a specialised task separate from the social movements, but a key activity around which social movements could coalesce. And of equal importance, the media environment characterised by a broadcast logic of geography was being supplemented with an environment characterised by a many-to-many logic of access. Though much has changed these insights remain as valid today as they did in the early 1990s." "–empyre– facilitates critical perspectives on contemporary cross–disciplinary issues, practices and events in networked media by inviting guests –key new media artists, curators, theorists, producers and others to participate in thematic discussions. –empyre– is an Australian based global community which preserves its autonomy as a non–hierarchical collaborative entity by engaging with new content on a monthly basis. The list was instigated by Melinda Rackham (AU) in 2002. The community grew exponentially and within the first year Adrian Miles (AU) and Rebecca Cannon (AU) joined briefly as facilitators. Long–term facilitators Christina McPhee (USA) and Michael Arnold Mages (USA) were invited to the –empyre– curatorium soon after, and during the next years they were joined by Jim Andrews (CA)and Felix Sattler (AU/GER). In 2005 Tracey Meziane (AU) and Marcus Bastos (BR) joined the team, and in 2006 and 2007 it was extended with Sérgio Basbaum (BR), Nicholas Ruiz III (USA), Renate Ferro (USA) and Tim Murray (USA). To find out more go to who is –empyre–"
"Design studies (like design) is a multifarious enterprise. A branch of the humanities, it comprises a wide range of critical perspectives on the meanings and values embodied in objects and places. It examines the forces that design exerts in, and on, the world – forces design sets in motion but does not control. Parsons' Masters in Design Studies program places particular emphasis on four points: the role of the designer and the design studio in redefining the scope of practice in the 21st century; design as an iteration of aesthetic and intellectual histories that continue to inform the present; the social, political and environmental behaviors and consequences of designing objects, places, situations, and systems today; design as the projection of different futures. Above all, the MA Design Studies program focuses on the development of articulate, critical voices that can speak to these issues. Students will be prepared to write for the academic context, the design community, and the larger public realm. Working in close proximity to MFA studio programs at Parsons, they also have the opportunity to integrate film, video, and other media into their work."